Voting in Hyderabad got off to a sluggish start on Friday as voters slowly made their way to polling booths. Hyderabad: Clad in a coat of winter mist, Hyderabad got off to a sluggish start on Friday as voters slowly made their way to polling booths. 5.15 pm: Polling comes to a close, peaceful voting across State: The first ever polls for the Telangana State Legislative Assembly came to a peaceful end at 5 p.m. on Friday with no reports of any major untoward incidents or disturbances. Medak assembly constituency is expected to set a new record in turn out of voters. The polling percentage registered in the constituency was 75.57 per cent by 3 pm. Deputy Speaker, Padma Devender Reddy is in the fray as the TRS nominee in the constituency. In Narsapur assembly constituency, it was 68.93 per cent. Chief Minister K Chandrashekhar Rao’s Gajwel constituency recorded a polling percentage of 61 per cent by 3 pm. 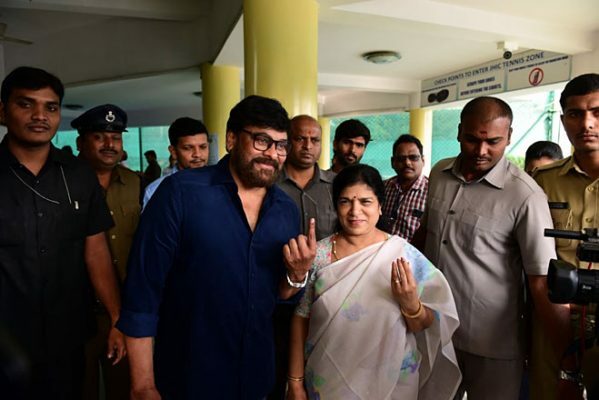 3:00pm: Hyderabad: The average polling percentage at 3 p.m. stood at 56.17 in the State, the office of the Chief Electoral Officer for Telangana has said. The polling percentage had been steadily climbing all day with the average at 10 a.m. reported at 10.15 per cent, followed by 23.04 per cent at 11 a.m. By 1 p.m., it climbed to 43.24 per cent. 1.55 pm: The polling percentage touched 47.8 per cent by 1 pm and it is expected to cross 50 per cent by 2 pm, according to the ECI officials. 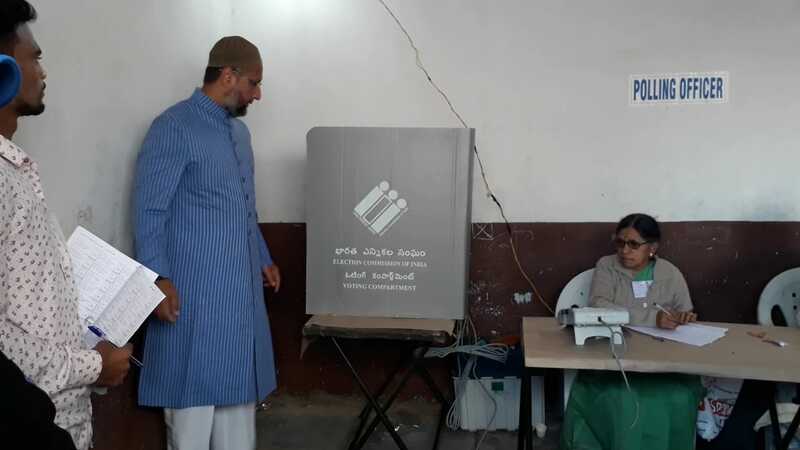 1.52 pm: Hyderabad district registered a polling percentage of 28.28 percent by 1 pm, with Amberpet constituency leading the chart with 32.92 percent followed by Goshamahal constituency with 32.46 percent. 1.30 pm: Telangana registered a polling percentage of 43.24 percent by 1 pm. 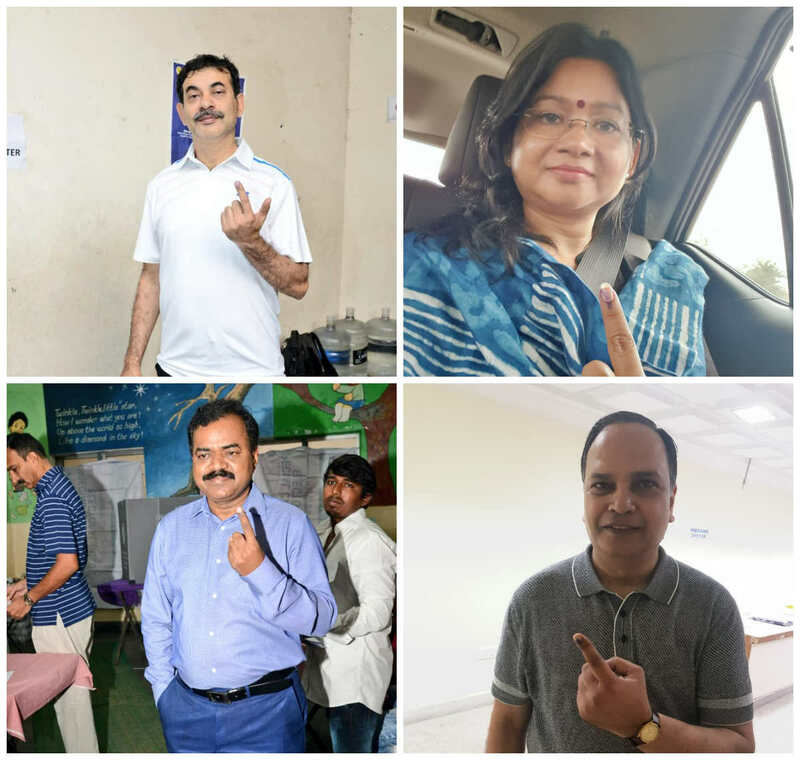 1.00 pm: Telangana Principal Secretary for IT & Industries Jayesh Ranjan, IPS officer Swati Lakra, GHMC Commissioner Dana Kishore and Chief Secretary SK Joshi exercised their franchise in Hyderabad. Telangana Principal Secretary for IT & Industries Jayesh Ranjan, IPS officer Swati Lakra, GHMC Commissioner Dana Kishore and Chief Secretary SK Joshi after casting their votes in Hyderabad. 1.44 pm: The Alwal police have taken Bharatiya Janata Yuva Morcha (BJYM) vice president TM Sai Kumar into preventive custody at a polling station in Malkajgiri constituency here on Friday. He was taken into custody in connection with a social media post, police said. 12.45 pm: CM takes part in voting at Chintamadaka: Chief Minister K Chandrashekhar Rao and his wife Shobharani exercised their franchise at Chintamadaka, his native village (Booth No 13) in Siddipet Assembly Constituency. He was accompanied to the polling station by the Irrigation Minister T Harish Rao. Residents of the village greeted him in a big way and he also responded wishing each one of them with folded hands. 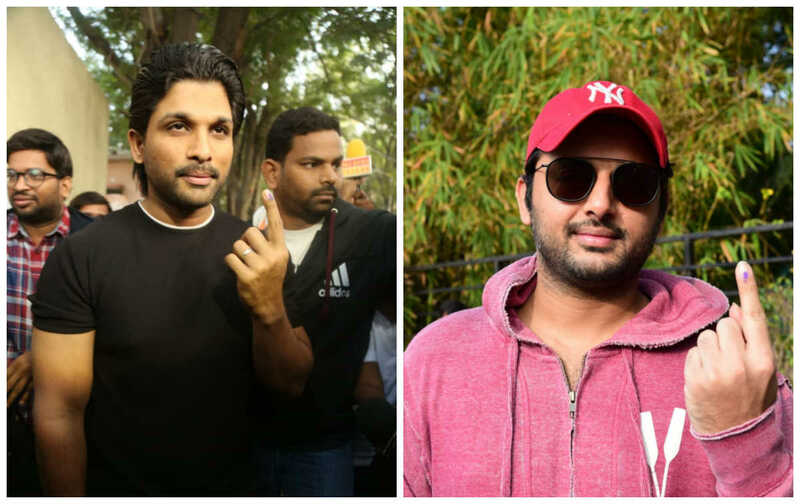 12.30 pm: Actors Allu Arjun and Nithin cast their votes in Hyderabad. 12.20 pm: Flying squad searches Congress candidate’s house in Hyderabad: Based on a tip-off, a flying squad searched the house of Feroz Khan, Congress candidate from Nampally. They did not find anything though. 12.05 pm: AIMIM leader Akbaruddin Owaisi, who is contesting from Chandrayangutta cast his vote at Banjara Hills. 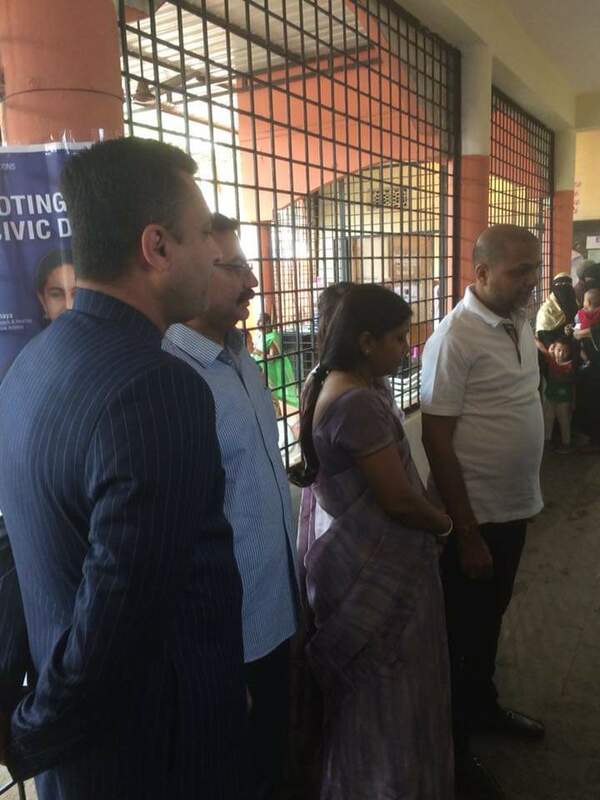 AIMIM leader Akbaruddin Owaisi standing in queue to cast his vote at Banjara Hills. 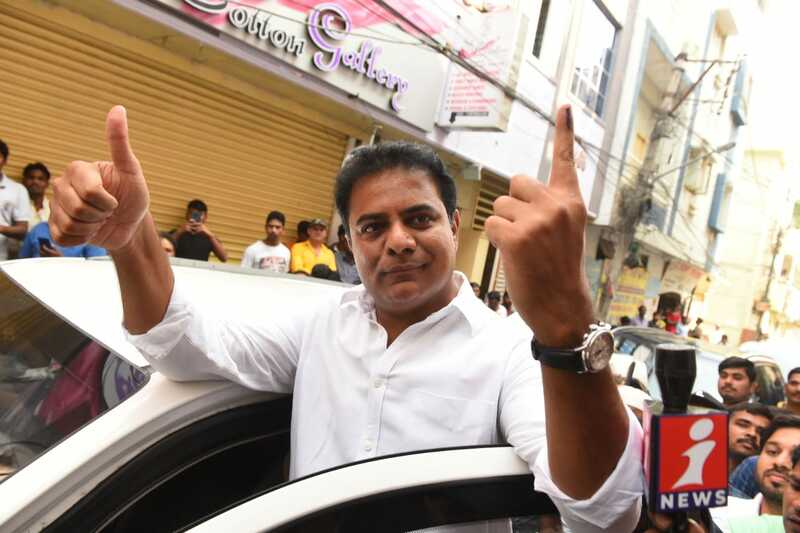 12.00 pm: IT and Industries Minister KT Rama Rao cast his vote at the St. Nizami’s High School in Banjara Hills on Friday. IT and Industries Minister KT Rama Rao after casting his vote at the St. Nizami’s High School in Banjara Hills. 11.45 am: Hyderabad district recorded an average polling percentage of 16.16 percent by 11 am. Goshamahal with 23 percent and Karwan with 21 percent recorded the highest percentages at this time. 11.40 am: Many of the rural polling stations in the state witnessed brisk polling in the first four hours. The overall turnout was 23.04 per cent by 11 am, according ECI sources. Nagarkurnool district registered the highest of 34 per cent by 11 am. It was 21.48 in Gadwal, 18.88 per cent in Khammam and 27.32per cent in Kama Reddy. 11.30 am: Deputy Chief Minister Kadiam Srihari exercised his franchise in the Teachers colony polling station at Hanamkonda. 11.15 am: Even as polling percentages remained low, there was no stopping those who wanted to vote. Not the winter chill, nor the physical challenges they had to face. 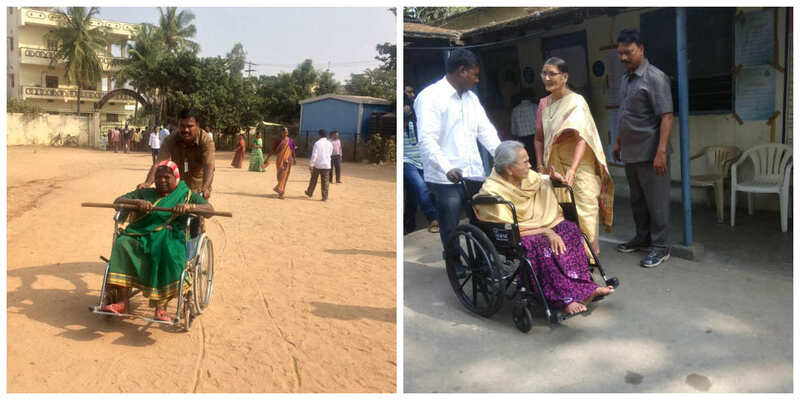 Many voters were seen being brought into polling stations on wheelchairs. Here is what our reporters and photographers sent in from Balapur, Tarnaka and other areas. 11.00 am: The polling percentages remained as cold as the chill in the air, not crossing double figures even after two hours. Top citizens however, showed the way as many came out in the first hour itself to cast their votes. 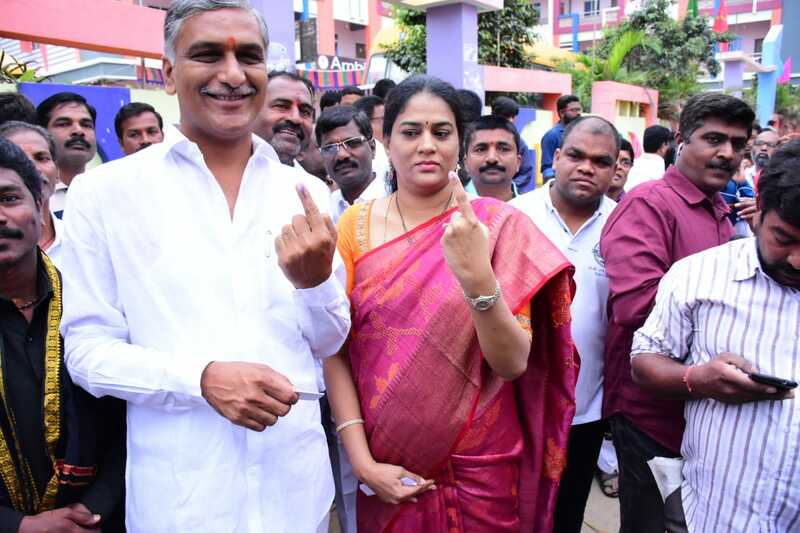 10.30 am: Governor ESL Narasimhan and wife Vimala Narasimhan cast their votes at Somajiguda, while Chief Secretary SK Joshi, Irrigation Minister T. Harish Rao and his wife, Nizamabad MP K. Kavitha, Agriculture Minister Pocharam Srinivas Reddy, actor Chiranjeevi and his wife Surekha, daughter Sushmitha, Nagarjuna Akkineni and Amala Akkineni, actors Nithin and Allu Arjun were among those who voted early in the day.